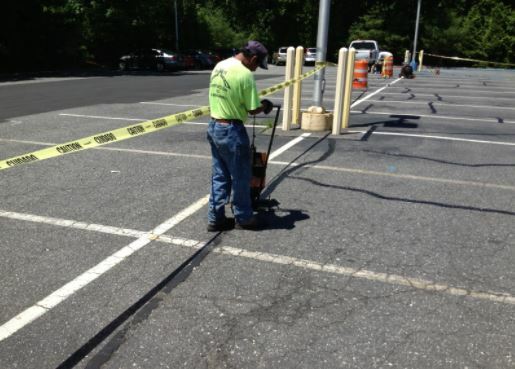 How often do you need to seal asphalt parking lot? Asphalt parking lot maintenance is important because it if is not taken care of properly, it can become severely damaged. If you have your parking lot sealed and looked after the right way it can last years longer than it would if you didn’t. It won’t just protect the surface of your parking lot, it will make it look much better and more attractive to your visitors. A parking lot that been recently laid with asphalt should be sealed in 12 months. After that, you should have it sealed every 3 years. If you seal your parking lot you will be avoiding the high costs of a parking lot maintenance services needing to repair it for you. Even though most businesses seal their parking lots more often, it really depends on the traffic, weather, and the quality of the application. Check your asphalt parking lot maintenance guidelines as well as parking lot maintenance costs to see what will be best for you. Be sure to come up with an effective parking lot maintenance plan as well. How do I patch asphalt parking lot? It is pretty easy to learn how to maintain a parking lot. You want to start by making sure that any loose material is out of the way. You can use a push broom to sweep any of that away. Also, remove any water that may be standing as well. Water will prevent the asphalt from curing properly. Next, you want to lay the hot asphalt on the surface and smooth it out with a flat and metal object. Make sure that you are wearing protective footwear. Smooth the asphalt out into a large square and make sure that the layers are even. To put the asphalt on the surface use a shovel. Once the basic foundation is laid, grab your push broom once more to sweep away any excess asphalt. After that, you should track it. Use a machine like WP1550 for this. Another option is to tar the edges to secure the patch. You also want to make sure that you are protected and safe. Engage in extensive research to find out which products will be best for you to use on your parking lot. You want to use gloves to protect your hands in case any of the hot material spills on you. Keep the area free of clutter and other materials. The only people that should be in the area are the ones that are helping you lay the asphalt. Keep children and non-workers out of the way because the contents will be hot. Keep an eye on machines and sharp objects as well. If there is any extra material, dispose of it properly. How long does it take for a slurry seal to dry?